Please note that this blog post is for educational purposes only. The costs listed here are approximations of what different options for conversions and vehicle modifications may cost. Costs will vary depending on when you read this post, your location, the accessories chosen, the dealers you use and more. Check with your dealer for exact pricing and warranty information. I have not received any incentive or payments to highlight the products or companies included here. What I have shared is based on what products I was presented with during my search and what I found through my own research. It’s been over a year now since we bought our new vehicle and lift for transporting Maya’s wheelchairs. Before that purchase, I was driving a Subaru Forrester and we were lifting Maya’s small wheelchair in and out of the trunk. This was adequate at the time but it became clear that Maya needed a much bigger and heavier wheelchair, possibly with power. There was no way we could continue to lift a wheelchair that big and heavy into and out of the trunk. So, off we went trying to figure out how to upgrade. We went through many stages of thinking through what we should do, how much money we should spend, and how to balance our immediate needs with Maya’s needs at the time and in the future. I am sure a lot of you struggle with these same issues. When deciding on equipment, furniture, or other support, we think about how long Maya may need certain kinds of support and how many thousands of dollars we are comfortable investing given the possibility that she may not need them later. For others you may already know what your child needs but cannot afford those supports without great sacrifice so you are waiting as long as possible to make those big changes. Over the course of a year before we made our final decision, we considered all possibilities, including full conversion vans/cars, manual ramps, power ramps, external lifts, internal lifts and even valet seats (vehicle seats that turn). 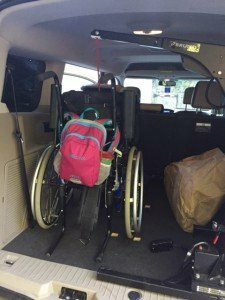 The decision making process was so confusing that we even delayed the purchase of Maya’s new wheelchair and its power features so we wouldn’t be forced to decide what type of vehicle to buy before we were ready. It is so important for parents, therapists and vendors to understand that when a family is deciding whether or not to purchase a power chair or to buy a very heavy wheelchair, they are simultaneously faced with the need upgrade or modify one of their family vehicles. 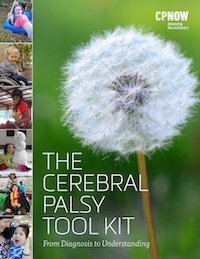 This can create two extremely expensive and complicated decisions you have to make at the same time, while trying to manage the daily living of a child with CP. There are many ways to solve these problems and lots of different options for you and your family. You will need to decide whether to make small adjustments to your car along the way or buy a fully converted vehicle instead, which allows your child to ride in her wheelchair without transferring. 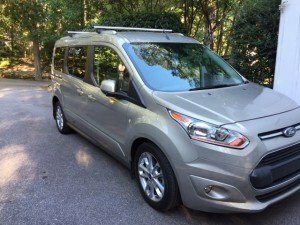 Purchasing a larger vehicle that you can have converted. **You will need to check with a reputable mobility expert to determine the vehicle eligibility requirements for modifications. Some families choose to purchase portable manual ramps. You may wish to investigate this option too but given the negative feedback I received about how difficulty these were to maneuver from other families and our mobility consultant, we chose to bypass this option and I have not covered them here. New conversion mini-vans often run between $42,000-55,000 and up depending on the vehicle, it’s options and the type of conversion. Smaller vehicles that have been converted like the Kia Soul, start at about $31,000 new (As I was writing this post I saw an online price of 29,995 for one with 12,700 miles). Lifts cost an average of $1000-$4500 installed. These are all expensive investments but given that back injuries can occur when trying to lift your child or wheelchair into and out of the car and those associated costs, it is important to carefully weigh the different factors involved in your situation. Take a breath though because there are lots of used vehicles with modifications that are for sale as well. Just be sure to do your research and evaluate the warranty information carefully both with regard to the vehicle manufacturer’s warranty, which conversion systems the car manufacturer approves and the warranty for the conversion itself. If your child rides in her chair will you take her more places? This question carried a lot of weight for me. I find myself skipping errands or short and potentially fun stops for her because I am feeling the strain of transferring. Without a doubt I thought I would take her more places if we had a fully converted vehicle because that would mean no additional transfers in and out of the car. But, after driving a converted van for a weekend I didn’t feel as strongly about it. Perhaps it was because I wasn’t used to the process but fiddling with the tie downs was discouraging to me as well. This experience led me to think that if we purchased a fully converted vehicle, I would want a docking system that was as easy to use as possible (and there are some out there like the EZ Lock). If you are already investing lots of money in vehicle modifications make sure you consider all aspects of your purchase. Something like the locking mechanism for the chair may make a big difference for you on a daily basis. If you don’t choose a full vehicle modification at the beginning, you may be able to have your vehicle modified later. You can discuss this with your sales consultant. If you don’t know who to talk to, begin by searching for dealers on the National Mobility Equipment Dealers Association (NMEDA). The answer will depend on the type of vehicle you have, if conversions are available for it, and the mileage (perhaps other things too). It is my understanding that most companies that perform vehicle modifications have guidelines for how many miles a used vehicle can have as part of the criteria for determining if it can be modified. If you get a fully converted vehicle, do you choose rear or side entry? The rear entry is less expensive because it requires less modification of the vehicle. Setting this aside it’s important to consider the parking situations where you live. Are you in an urban area where you will be parallel parking a lot? Is the vehicle’s bottom clearance an issue where you live? If so, there is more clearance in a rear entry converted vehicle. Some people (myself included) are concerned about side entry vehicles because of the possibility of someone parking in the striped area next to your vehicle making it impossible to get back into your vehicle unless you move it to another location. Others don’t like the idea of entering and exiting the rear of the vehicle because of the space required to deploy the ramp and because of traffic that may be coming behind the vehicle. This can be a tough decision to make. The interior space also differs for rear and side entry vehicles. Interior considerations relate to trunk space, which type of conversion will accommodate the user’s wheelchair and height, where other passengers may want to sit and where the individual in the wheelchair is going to sit in the vehicle. I was told that side entry vehicles tend to be more popular in part because it allows an adult wheelchair user to drive the vehicle or have access to ride as a front passenger. Also, don’t get used to the factory seats when you are looking into these modifications because, with most of these modifications, you will be forfeiting some of your factory made seats. I wasn’t so thrilled about this especially since they didn’t feel as comfortable as the regular seats to me. Just remember there are going to be significant tradeoffs with a converted vehicle and you have to get comfortable with this reality from the beginning. It’s really important to see the different options in person and ask about trying out the vehicle you are interested in for a few days. Take your time through this process! By driving the vehicle and taking your child in and out, you will experience and understand things about the vehicle you hadn’t even realized were so important. For instance, after trying a side entry van for a weekend, I realized that the back row seats felt awkward to me because my feet did not touch the floor when I was sitting there. I realized that the floor is dropped in the side entry modification process, allowing headroom for the wheelchair user, but at the same time making the back row of seats further off the floor. 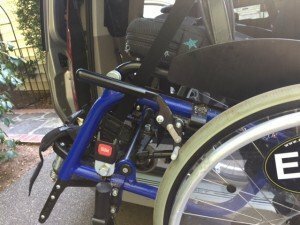 Is there funding for vehicle adaptations and conversions? Yes. There are some grant programs, especially for veterans, and some allowances for vehicle modifications through state Medicaid waiver programs. In addition, some car manufacturers offer small rebates for vehicle modifications when you purchase a new vehicle. Many dealers offer vehicle financing. You will find some funding resources listed at the bottom of the blog post. What about vehicle seats that turn? Would that work for us instead? We definitely thought hard about these. They seemed like the perfect solution. But then I heard the price for what I wanted and it was half the cost of a full conversion. We still may pursue something like this later. Keep in mind that if you are purchasing a vehicle to modify with valet style seats, you need to be sure that your selection is compatible with your vehicle and in which passenger’s seats they can be installed. As an example, our Ford Transit Connect only has the option for a front passenger valet seat which will not work for Maya at this time. What if we had a lift in the back that can take away the heavy lifting of her chairs in and out of the vehicle? There were a few options when it came to lifts but it was not nearly as overwhelming to determine which one we wanted compared to thinking through a full vehicle conversion. Lifts can be placed on the inside or outside of a vehicle and there are several options for how chairs can be loaded and secured. These options weren’t cheap but they certainly were exponentially less expensive than a vehicle conversion. If we decided to purchase a lift I wouldn’t feel bad about the money we invested. We decided against a full conversion and instead purchase a Ford Transit Connect and a Big Lifter that could accommodate Maya’s manual and power wheelchairs. It became clear to us that Maya was making enough progress in her transfers that spending less money for this combination, rather than a full conversion, would meet our needs at least for a few years. I’ve been very happy with the decision so far. I love that the Transit Connect handles more like my small SUV than the minivans I test drove. It has lots of room and a great back up camera. The only drawback is that it doesn’t have as many options as other popular minivans on the market like the power sliding doors and trunk (maybe the newer models have them?). I don’t mind especially since the price was great and we were potentially saving for a full vehicle conversion down the road. The Big Lifter by Bruno (about $1500.00 plus installation–depending on the options you choose and we had a $1000.00 rebate from Ford) was a great choice as well. I wanted an internal lift and storage system (not on the outside of the vehicle), a system that maximized trunk space and the option to use the lift with more than one chair. It wasn’t as easy to use as the JOEY platform lift (about $2500.00 plus installation–depending on options chosen) but I preferred having the lift installed on the side of the trunk instead of having it centered. By the way, I am highlighting Bruno lifts here only because those were the ones introduced to me in the showroom. After more than a year now I can say that both the vehicle and the lift have suited us well. I have lots of trunk room and have been able to add her walker, gait trainer, or bike back there even with Maya’s wheelchair. We also got to keep our factory made second row of seats. When the trunk of the vehicle is open I am protected from the rain (we don’t have snow here) while I hook in the straps. The Big Lifter isn’t ideal (at all) on an incline or hill but we don’t have much of an issue where we live. There is still a lot of physical labor for me to transfer Maya in and out of our vehicle but for now we are happy with our little car van. It’s fun to drive and very practical as well. 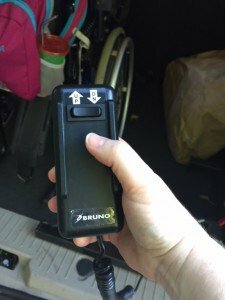 Disability.gov-Where Can I Find Help to Make My Vehicle Accessible? Previous postVoice Dream--The reading app that just saved us $2700.00 Next postWhat is that new gait trainer Maya has been using? It's called the Up and Free and its fantastic! Thank you for this! My son is almost 4 and we just got his first wheelchair in the last year. For now we can lift it in and out of our SUV but I’m sure this is something we’ll need to do in the future and I’ve been wondering about the process and all the options. You are very welcome. I hope it makes it easier for you than it was for us! This is helpful. Thanks for sharing. Great read! 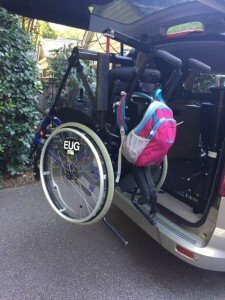 It’s worth investing in a wheelchair accessible vehicle for our comfort. It makes our transportation easy and convenient. Nice share.